Ashley Suddes BHSII UKCC Level 3 is an approachable friendly, trainer, willing to help all riders and all horses to achieve their aims. She is experienced with young horses and competes regularly in Dressage, BE, and BSJA. 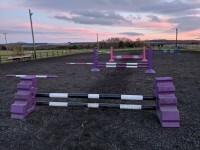 Ashley will be teaching Grid Work Clinics for groups of up to four in our outdoor arena, or indoors if the weather is inclement. Places are £25 each.